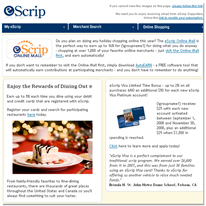 Electronic Scrip Incorporated (ESI) is a California-based corporation dedicated to establishing relationships between commerce and community -- to provide resources to organizations and projects that support children. ESI introduced the eScrip program in 1999 and has distributed over $200 million to schools and youth organizations across the country. *Program not valid in Colorado, Wyoming, South Dakota, Nebraska, and New Mexico. 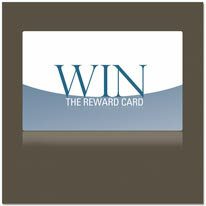 WIN Reward Card partner: Seaside Market Rewards Card - Shop and Earn up to 3%. eScrip Community Card partner KV Mart. ESI is committed to bringing our services to the fast growing Hispanic Community. Through partnerships with KV Mart, Treseirras and other grocers who serve this burgeoning markets, we are able to provide money needed in these communities. Nordstrom, Home Depot, Apple and Barnes and Noble are just a few of over 1,000 great online mall merchants available for supporters to earn for their group, visit the online mall.